According to some studies, as much as 20% of the average household's expenses are health care costs. Even in good economic times that's a serious bite out of most people's paycheck, but when times get tight, that can be the difference between having a house and living out of a box. Emergencies can't be avoided, and you cannot live a lifestyle that will negate the possibility of a broken arm or some disease striking a family member. Still, there is quite a bit that can be done to reduce the cost of health care. The first and most important is to eat healthy foods in sufficient amounts. Food costs are always going to be a significant portion of the budget for any family simply because without food, you die. That makes it the highest budgetary priority. Food is fuel, allowing you to carry out the tasks necessary for life and pleasure, and if you do not get enough fuel, you cannot fight off disease, infection, and whats worse, a hungry, weak person is more likely to have accidents. If you are unsteady, thinking slowly, and weak, you're more likely to cut yourself, fall down stairs, and so on. Budgeting for enough good food is an important and simple way to keep health costs down, if possible. And good shopping techniques will make that portion of the budget smaller than you'd think. Another useful way to keep health costs low is to clean. Our depression-era grandparents and great grand parents had to fight diseases and health problems that are virtually obliterated in our lifetimes such as Polio and Smallpox. Because of those deadly fears, those generations tended to be much more scrupulous about keeping the house clean. To this day, habits learned in those years compel these people to clean up dishes within minutes of being dirty, scrub floors that look clean, and keep their environment as clean as possible. Some of this is obvious: clean your cutting board. Wash all food handling implements. Clean or use a different tool between different kinds of food. Clean all surfaces, including the floor. Wash handles, phones, and so on. But there are other less obvious ones that people these days don't bother with. Have you ever washed your pillow? Like it or not all that drool and more get into the pillow and fester. Do you wash your toothbrush before using? Just a bit of toothbrush on the bristles rubbed in can clean it pretty well. Do you wash things you get from the store before using, like vegetables and fruit? E Coli killed a lot of people in Europe who didn't bother with this simple step. When you wash dishes, do you clean the sink up first? How about that washcloth or sponge, does it smell funny by now? It smells that way because of rot and bacteria. Parents with babies around usually are more careful with this than others, since the little tyke is a vacuum sucking up anything lying on the ground, edible or not. But it really is good for everyone. 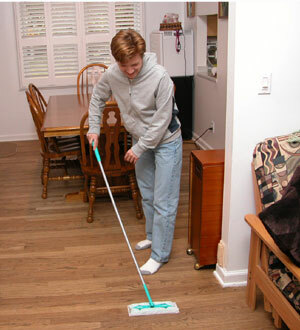 A clean house means fewer germs and sources of infection. You don't have to turn into Howard Hughes and use a fresh tissue to touch everything, but just common sense cleanliness can prevent illness. Back when your food storage was an icebox with literal ice in it that had to be replaced and your canned food was sometimes sealed with lead and often not very reliable, people were a lot more careful. But those lessons are helpful for us today, when energy, storage, and canning is a lot more reliable and safe. For instance, keeping your refrigerator cleaned out regularly makes a significant difference. By the time you notice that amazing purple mold on the pasta, spores have spread all over the inside of your refrigerator. Opening up a container that's moldy is a not-so-refreshing blast of spores in your face. Don't let things get that far. And clean that refrigerator regularly, because its full of little microscopic food particles and bacteria. Don't buy damaged or bent cans. The seals on these cans are much better these days, but they still can have tiny breaks that will result in potential food poisoning, which is no joke. At best you'll wish you could die from how awful you feel. At worst, you will. Avoid packages that are bloated or distorted as well: that's often caused by gasses building up inside, which are from bacteria growth. Defrost meat in the refrigerator, microwave, or under flowing water (an old cooking trick), not on the counter. Slowly warming meat slowly grows bacteria colonies. However, there is a line here that you have to be careful with. A lot of food can be eaten past the point its really best. Just because the milk carton says its expired doesn't mean the milk has gone bad: you can always smell milk that's gone bad, if it smells normal or not conspicuously odd, its potable. You can trim off mold from cheese safely, because cheese is basically in a constant state of controlled molding to begin with. Just cut deeply enough you get past the roots. Fruit or vegetables with bad or soft spots can be cut away to keep the good parts in many cases. What you are trying to find is the idea line between thrift and health. A poor person cannot afford to throw food out unless it is truly unhealthy, so you need to push the food to that line as closely as possible to not waste money you do not have. The reason this matters is that you're presumed to be very poor in this series, and that means you have to get as much out of every single dollar that you possibly can. So you need to know the difference between dangerous or unhealthy... and a waste of money. Yes, that apple is getting sort of shriveled and odd feeling, but it probably is still edible if it isn't liquifying, molded, or getting dark. It may taste slightly less wonderful, but dried or turned into apple sauce (or pie) it will be fine. And putting up with not so great because you can't afford the best is part of depression survival. Exercise is an important part of staying healthy as well, but if you're dirt poor living in a depression, you won't have the money to run down to the health club or gym. You won't be able to afford that new exercise device you saw on late night television, or that special outfit, either. There are ways to exercise without all that, though. You don't need any special equipment to walk or jog. You can do calisthenics at home for free: all those push ups and so on do not require anything but space to move in. A bicycle is cheap, and it represents a great deal of exercise while giving you a chance to get out of the house and even run some errands. You'll find that being poor and making all these fiscally responsible choices means you have less and less free time. That means less leisure time, which we all need some of to recharge and face life. So you will want to get out and do something other than labor over survival every day, and a bicycle or walking trip every day or two can make a significant difference in your life. Because being physically healthy won't help if you're mentally miserable. Staying healthy while poor is a critical skill to learn: you literally cannot afford to get hurt. Usually in these kind of economic conditions, there's not going to be any sick leave waiting for you, because you took the first job you could. And since so many people are looking for work, your boss won't sit on your absence very long, because he's struggling to survive too and can't afford the reduced productivity. So that means you can't have days missed at work, you can't afford doctor bills and medicine, and you can't afford to stay home and take care of a sick child. Best to avoid that as much as humanly possible before it is a problem. *This is part of the Economic Depression Survival Kit. **UPDATE: added a few lines about exercise. For a while after college I thought I wanted to be a cook, so I worked in a number of professional kitchens, including some pretty fancy joints. That experience taught me that most raw foods can be safely used way past the point most (modern) home kitchens would chuck 'em out. Also: "pretty" does not necessarily mean "tasty". And, it made me remember how my Grandmother, who grew up on a South Carolina farm during the depression, wouldn't throw anything out unless it could get up and crawl away from you. She cooked wonderfully & nobody got sick. Butter is what will eventually kill my family, and I don't mean by clogging our arteries... I mean it always sits out on the counter in that little glass covered butter dish and never ends up back in the fridge. It's a lot easier to slice that way, but one of these days it's gonna bite somebody!